Today, dermatology remains at the cutting edge of medical science and technology with incredible breakthroughs emerging every day that give fresh hope to millions of people suffering from the many incurable skin diseases around the world. Indeed, dermatology is one of the most dynamic areas of medicine, and over the last few decades we have seen various subspecialties such as photobiology, immunodermatopathology, genodermatology and pediatric dermatology flourish within the larger context of clinical dermatology. The constant evolution of our specialty has required dermatologists to courageously embrace new concepts and modify their care plans as new treatments, such as biologics agents, become widely available. A conscious effort is needed to maintain a balanced approach, stay away from commercialization and develop our professional competence in keeping with best clinical practice that is being promoted around the world. Asia has one of the world's most unique geopolitical mixes of cultures and ethnicity. Economy-wise it is a truly vibrant and interesting emerging market with the potential to be the world leader for the next decade. This is evidenced by the arrival of several global industrial giants, who are beginning to make their mark in this region. At the same time, it is also home to some of the world's poorest and most deprived human communities. Today, Asia's population stands at 3.6 billion and is growing at the rate of 1.2% per year, inhabiting a land mass of only 25 million square kilometers, compared to Latin America's population of 550 million in 20 million square kilometers. This is the perfect recipe for overcrowding, sustained poverty traps and outbreak of infectious diseases, which are the real challenges for those wanting to deliver better medical as well as clinical dermatology services. Asian populations will continue to grow for many years to come, increasing pressure on the region's natural and human resources. In the next 35 years, national populations are predicted to grow in every country of East, South East, South and Central Asia except Singapore, Japan and Kazakhstan. Populations will double or nearly double in Pakistan, Nepal, Bangladesh, Afghanistan, Cambodia, and Laos. Growth rates will also be particularly high in India, Indonesia, Iran, Malaysia, Mongolia, Myanmar, the Philippines and Vietnam. Much of the population growth projected for the next few decades will occur in countries that are least capable of coping with additional stress on land, water, and other natural resources. In 2001, Prescott-Allan released the results of their study where they showed that the countries where population is projected to grow fastest have some of the lowest income levels in the world. These countries already rank high in terms of environmental stress. It is clear that in a scenario like this, emphasis on dermatology service provision and development will not be high on the list of priorities of the politicians, health economists and policy-makers of most Asian nations. In short, the ball is in our court. The task is therefore left to the dermatologist as the custodians of this discipline to make things work and move under minimum resources through close networking, sharing of expertise and seamless clinical dermatology training programs that will be the platform for future dermatologists. The operational challenge is to get ideas and programs across borders to countries and to people speaking completely different languages and practicing in completely different cultures and political systems. This is our biggest challenge. Getting the right business model is important. The commodity we are talking about is not money but the common desire and drive of good professionals to share and exchange knowledge and technology to communities in need. Closer to heart is the challenge of cosmetic dermatology which is threatening to engulf members of our fraternity, both young and old. The rise of managed care, increasing fragmentation of the field of dermatology, lower salaries paid to specialists in clinical dermatology compared to other fields of dermatology, and a lack of political will in the specialty, have put tremendous pressure on clinical dermatology in Asia, as in the rest of the world. In addition, escalating health care costs and the long lag time between new discoveries in the treatment of skin diseases and the time it actually reaches patients in Asia, have altered economic incentives such that it has become increasingly common for dermatologists to handle a mixture of clinical, surgical and cosmetic interventions, and in some cases, purely cosmetic procedures. Hence we may be seeing the beginning of the end of the day for the 'purist' clinician in dermatology. There is no doubt that products and procedures designed to advance the practice of cosmetic dermatology have flooded our specialty during the past ten years, and that cosmetic dermatology will continue to grow in scope and size over the next few decades. However, while the needs and desires of the consumers will continue to influence the direction of dermatology, as with other specialties, we as a medical profession have the responsibility to safeguard our integrity as healthcare providers. Today, many newly qualified young Asian dermatologists would immediately gravitate into the lucrative field of cosmetic dermatology forsaking the calling of their discipline. Few would stay to endure the long hours tediously caring for the sick that genuinely need what we were trained for. We cannot allow a situation where dermatologists are seen as beauticians, rather than people who treat the ill. Cosmetic procedures should be grounded in clinical dermatology, rather than seen as a new subset of our specialty that represents dermatological practice for the future. It is expected that many dermatologists will throw up their hands in submission and jump onto the ship to the land of lasers, IPL, Botox, fillers, golden threads, and silver needles. The challenge is how to turn this ship around. What makes clinical dermatology special is that it is a dynamic and practical science. Doctors and patients can virtually see in real-time their disease getting better or worse day by day. No other organ or tissue will offer its clinician such a privilege. The joy of seeing dermatological science display its miracles on disease skin gives a feeling of satisfaction that money can't buy. What we need next is to set the benchmarks in clinical dermatology as a practical science to be enjoyed by all. In this we have dermatopathology. Dermatologists in Asia should adopt dermatopathology as the basic benchmark of good clinical practice in making accurate dermatological diagnosis. This is a ready tool that we are just not using enough. Biopsy rates are too low in everyday dermatological practice here. In many Asian countries, one dermatopathologist virtually serves the entire country. We do not biopsy because there is no ready dermatopathologist around. The fact is that, there are just insufficient dermatopathology services to serve the thousands of dermatologists, a situation rampant across the region. This is a major challenge and we must address it. Building a critical mass of specialized and dedicated dermatopathologists is one of the priorities that the profession itself can address without going to the policy-makers and the politicians. The Asian Academy of Dermatology and Venereology (AADV) have taken this first step in 2011 to commence the Fellowship Training program in Clinical Dermatopathology (FAADV). This is a dermatology subspecialty training program like no other undertaken in any other part of the world. The initial support from the regional bodies has been overwhelming. The first observation is that there is that there has been great interest from our dermatologists as well as general pathologists in such programs. 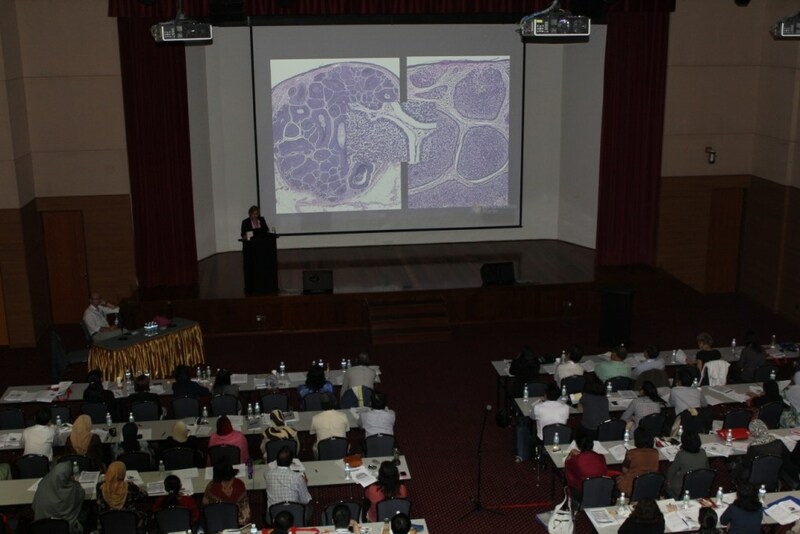 Approximately 150 delegates attended the first basic course held in Kuala Lumpur in October 2011. The advanced course, attended by a similar number, was held in 2012 (Photograph 1) together with the first FAADV (Dematopathology) examination in which three candidates passed (Photograph 2). A second post-basic dermatopathology course and examination is scheduled for Danang, Vietnam on 09 April 2014 in conjunction with the 21st Regional Conference of Dermatology (Asian-Australasian). Adding clinical and basic science research upon the above, AADV expects to push Asian dermatology training over the next ten years. There are important lessons to be learned from experiences of the International Society for Investigative Dermatology. Despite its importance, its international membership component only has 499 members representing 40 countries, of which only Japan and Korea are among the top five non-English-speaking countries. Even in Japan, the President of the Japanese Society for Investigative Dermatology has reported a falling trend in number of younger dermatologists taking interest in this area of dermatology. Elsewhere in Asia, there is just little or no interest in investigative dermatology. This trend must be arrested, hence the call for the formation of an Asian Investigative Dermatology Group to stir up interest and motivate the present and next generation of dermatologists. We need to call upon the strength in investigative dermatology from our colleagues in North and South Asia to help leapfrog the rest of Asia in investigative dermatology. One priority is to continue to emphasize and promote research and innovation in the various sub-specialties that make dermatology a joy to practice. Asia is a treasure stove for basic and clinical dermatology research. We have boundless clinical material well beyond what is seen in the Western countries. First and foremost, it is timely to review research and publish on clinical epidemiology of skin diseases in Asia. It is also timely to review this as a whole, and how these diseases are currently managed and treated in the background of our many commonly practiced traditional and indigenous treatment modalities. We have to harness the effects of the many recent breakthroughs in our specialty and how these new medications and therapies may or may not be relevant in our practice here in Asia. Several key areas will be pivotal to our success in this field in the next 10-20 years in Asia. The challenge now is to develop clinical and basic science research, look at new drugs in old fields and also to relook at older drugs which have been left behind by the commercial pressure of newer agents There is also much to be done for systemic biologic agents for treatment of inflammatory skin diseases, biomedical engineering, stem-cell therapy, minimally invasive procedural dermatology and patient-related issues. In Asia, as in the other continents of the world, clinical dermatology is being assailed on all fronts by other medical specialties, a trend that emanated from the developed countries. Already, in many countries, dermatologists no longer exclusively handle HIV and sexually transmitted diseases which have drifted into the province of infectious disease specialists, urologists and genito-urinary medicine physicians. Many Asian dermatologists themselves have given up looking at leprosy, TB and other traditional chronic skin infections. Otolaryngologists, allergists and immunologists and the like have moved in to claim their ground. To the rheumatologists treating psoriatic arthritis, cutaneous manifestations of psoriasis are no longer the key issues when they see patients. If we do not react, dermatologists may soon find themselves excluded from providing care for these patients by insurance companies, third party-payors and managed care organizations. With these changes, dermatologists need to realign and vigorously develop and defend our core territory, otherwise the day will come where dermatology would really be a minor discipline whose main concern is the beauty rather than the health of the skin. By then dermatology would really be just skin-deep. For a good measure dermatologists should take leadership in subspecialties like allergy, clinical immunology and cutaneous oncology, among others, to keep this desire for improvement burning. With the march of globalization (The World Trade Organization, General Agreement on Tariffs and Trade, ASEAN (Association of Southeast Asian Nations) Free Trade Area, ASEAN Framework Agreement on Services and the Mutual Recognition Arrangement), Asia and in particular, South East Asia is becoming increasing borderless with respect to movement of medical practitioners and services. The day is already here where a dermatologist from one Asian country can freely move into a neighboring country to practice, provided they can fulfil the existing rules of the host country. With this freedom of movement come the issue of turf-protection and the standard of training in dermatology and how to harmonize it. There is often a perception that a dermatologist from country A is never good enough for your own country B. This may not be really true but a mindset change is needed. The fact of the matter is that there may be many different training systems for dermatologists in the different nations in Asia. Standards, point of entry, qualification and language of instruction may differ. Having looked at different system across Asia, we can confidently say that in dermatology, the basic approach, curriculum, clinical training and post-graduate supervision of full-time dermatology trainees are essentially uniform across the region. Whilst politicians prefer to divide services, we as professionals should move the other way by harmonizing and synergizing our strengths across all nations in Asia. What is needed is a platform to harmonize the different training programs that will allow trainees to move across nations to enrich and expand their experiences seeing and treating skin disease in different geographical and cultural scenarios. At the end of the day we shall have a truly qualified professional made in and made for Asia. A harmonized Clinical Dermatology Fellowship Training program is the target for the near future. Together as a fraternity, dermatologists need to find new strategies to develop clinical dermatology in the context of our Asian geo-political and socio-economic uniqueness. Programs are needed to foster fellowship and mutual respect between our fellows across North and South, East and West Asia. In this context, regional organization like the AADV can help build bridges to enhance dermatology knowledge exchange and technology transfer within Asia. This mutual framework cannot be built with money but with common political will and commitment.